The time is almost here. The final season of the Game of Thrones is right around the corner. And fans can't wait to see the outcome. I don't know about you, but I can't think of a recent show - maybe any show - that I've anticipated this much. And I'll be shopping for those special Oreos tomorrow. The show has had a lot of characters, although not nearly as many as the books, thank God. 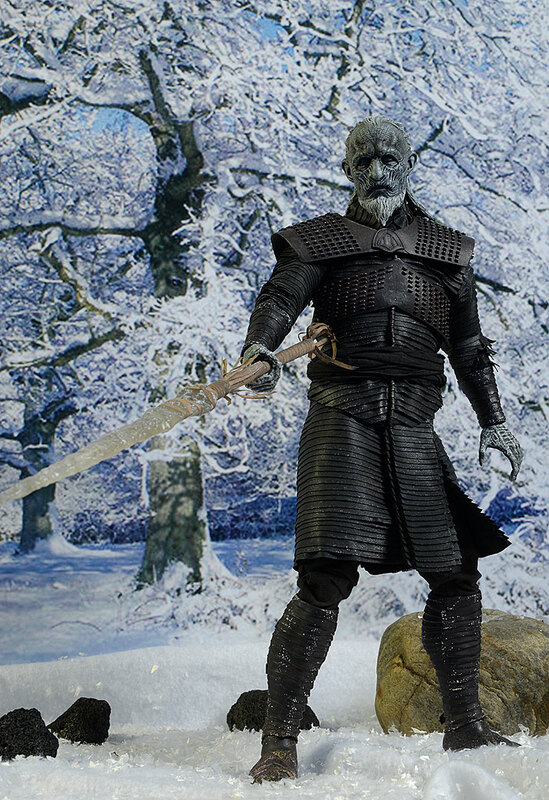 There are many forces for evil, but none quite as menacing as the White Walkers, the army of dead coming down from the north. 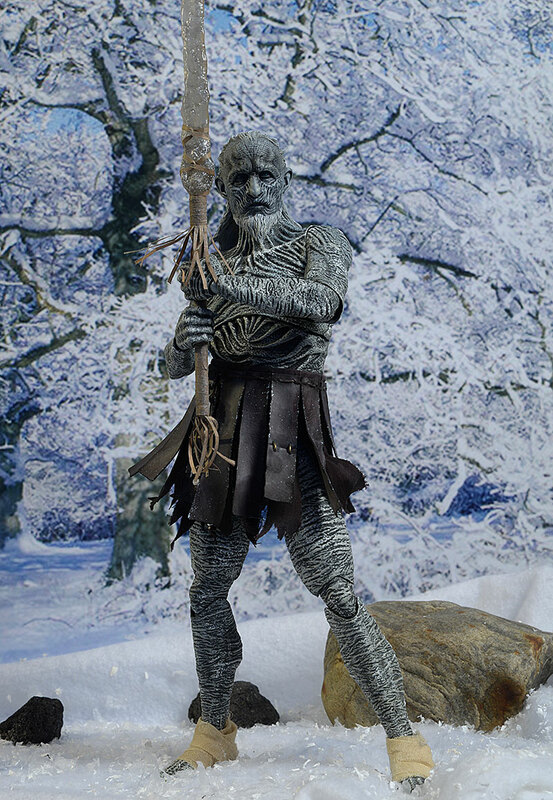 ThreeZero has added their first White Walker character to their line of sixth scale figures, just in time for the premiere. This figure comes in two versions - the regular for around $185, or the deluxe (reviewed tonight) for closer to $205, depending on the retailer. He's just started shipping. 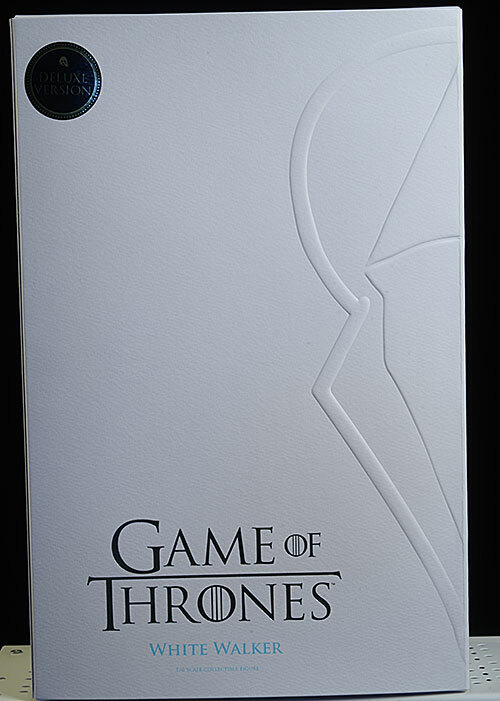 The bright white package has an embossed slip cover, and is made from very sturdy, thick cardboard. The interior trays hold things safe, and it's all collector friendly. There's even a brief instruction sheet to help with the costume swap with the deluxe version. This is a really impressive portrait, with a ton of tiny, tiny detail in the skin and hair. This dude is dead of course, and the weathered, wrinkled skin is heavily pock marked and striated. It looks shriveled against the skull, and the harsh conditions are clearly evident in the damage. But the most amazing feature is the hair, especially the beard. It's sculpted, and the long hair in back can be a bit restrictive (more on that in the Articulation section). But the detailing is extraordinary, and shows off how good a hair sculpt can really be. Check out the beard in the photo below. Yes, the hairs are very fine, but that's nothing new with great sculpts. But there are tiny hairs on the surface running slightly counter and across the lower hairs. This sort of layering, with a bit of chaos, makes it tremendously realistic. The expression is well done, with a straight gaze with evil intent, and a slightly open mouth. The tiny exposed teeth are impressive, and the sunken eyes appropriate. If you think that creepy skin texture ends at the hands and head, think again. You can swap out the costume on the deluxe version, but the regular is also completely sculpted head to toe with the decaying, frozen flesh. There's a little bit of smooth plastic around the front of the hip joints, but otherwise you get crinkly nastiness all around. He's a pretty big dude, coming in at almost 13" tall. Great sculpts can only really shine when they are covered in great paint. That's the case here, with some excellent work highlighting the frozen appearance. This guy is definitely going to be an Eddie Wires nominee for 2019. The eyes are straight and clear, with a glassy, wet look. The skin is frosty, right down to a slightly 'snowy' speckling. Even though they are working with very little color, they get the most out of various shades of gray, highlighting the detail in the portrait and craggy skin. Again, this paint work extends across the entire body, something quite unusual in sixth scale. The body is less lanky, more realistic than many of the living ThreeZero characters. The ball neck is a bit restricted by the long hair, but it's less of an issue than I expected. You can still get some good side to side tilt and forward movement, but you won't tilt the head very far back. 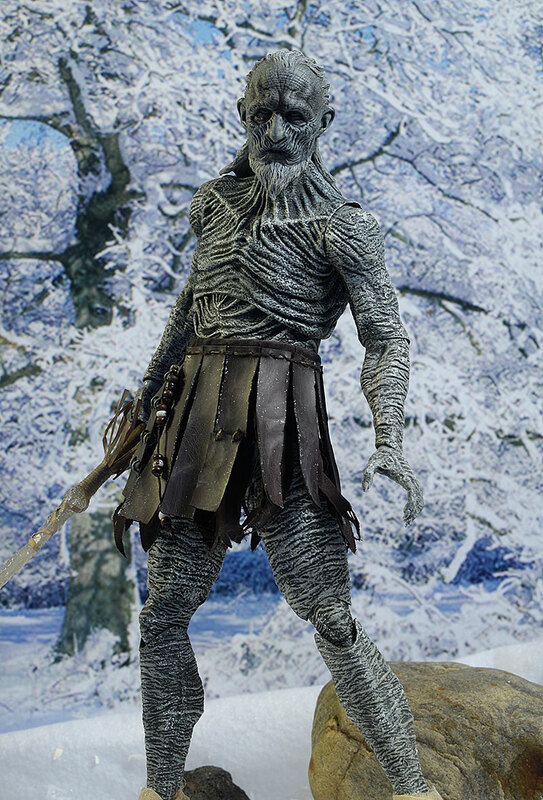 The rotating hinge shoulders, elbows, and wrists aren't the most poseable combination, but they do allow the cool skin sculpture to look its best. You can still get decent arm poses, especially with the short ice spear. The torso is particularly useful, with a rolling chest joint that works great. You can break up the straight lines in his upper body using it, and create more natural stances. The ball hips, double pin knees, and ball ankles work terrific, and allow for plenty of short to deep stances. The ankles are tight too, so he can maintain these poses, and the rocker movement allows the feet to be flat on the ground. The one area where he comes up a little short - even the deluxe version - is with the Accessories. He comes wearing a set of open hands, and there's a set of fists to swap in. Like Sideshow, ThreeZero includes a wrist peg attached to every hand, always a big plus in my book. 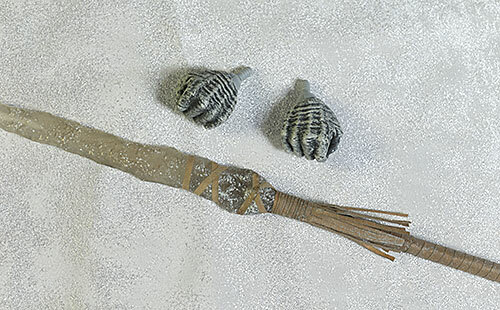 The hands are pretty soft, which allows you to get the spear in place without damaging it. The hands swap cleanly, and stay on without any issue. 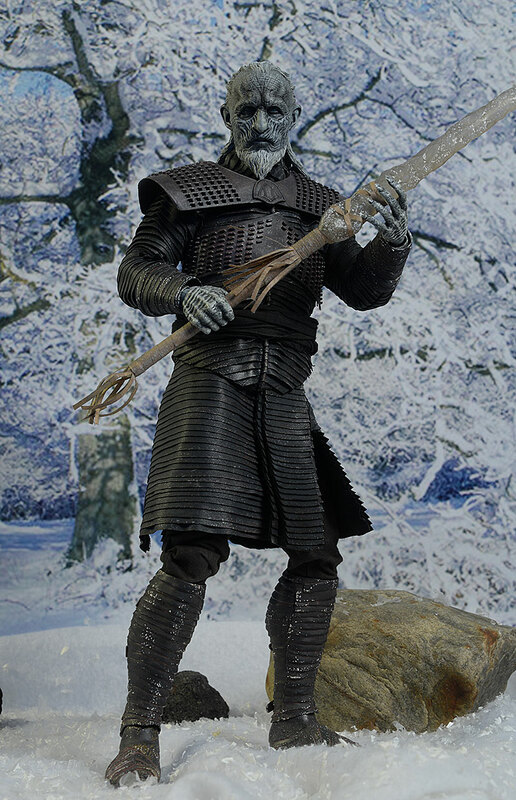 And yes, there's his cool ice spear. The blade is translucent, and looks great, but the fringe on the top and bottom of the handle is paper. They give you an extra piece in a little baggy, just in case you damage it and want to replace it, but I would have preferred a sturdier pleather material. And that's it for the regular release. If I were grading that one, he would have lost another half star here. However, the deluxe provides you with the extras to go with his alternate appearance. 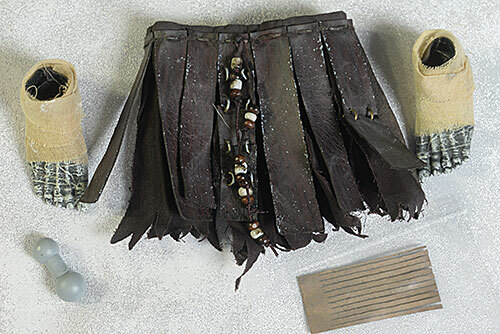 There's a skirt, made from a sturdy material, as well as a second set of cloth wrapped feet. His standard armored costume has a larger plastic piece that covers the shoulders, and to provide enough clearance with the bulkier outfit, the head has a long neck post. Without the shirt and armor in place, the head would sit much too high on the neck, so they provided a second, shorter ball post as well. Swapping clothes is pretty easy, although I doubt I'll ever get the wrapped cloth belt to look as good as they had it. Getting both looks is a nice touch, and since it's only another twenty bucks, I'd go that route if possible. The outfit is well made, from quality materials. ThreeZero has done a nice job with all the costumes in this series, even with the figures that fell a little short in other ways. The standard figure comes wearing cloth pants, with an armored 'skirt', armored tunic, shoulder armor, two piece boots, and vambraces. 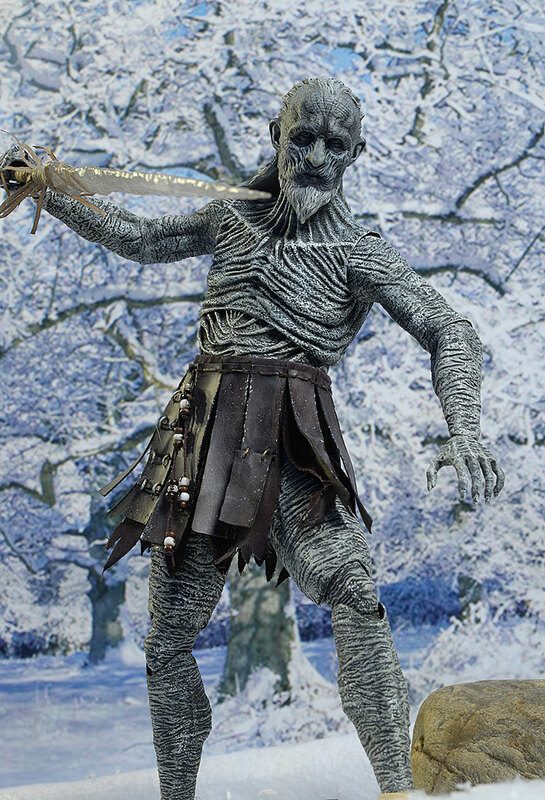 There's also a weathered cloth belt that simply wraps and ties around his mid-section. They've painted the pieces to look old and weathered, and Velcro keeps things together. It was quite easy to remove the clothing and put on the new feet, shorter neck post, and simple skirt. Either outfit looks great, but I think I'll be sticking with the armored look on the shelf. This line is really flushing out nicely. 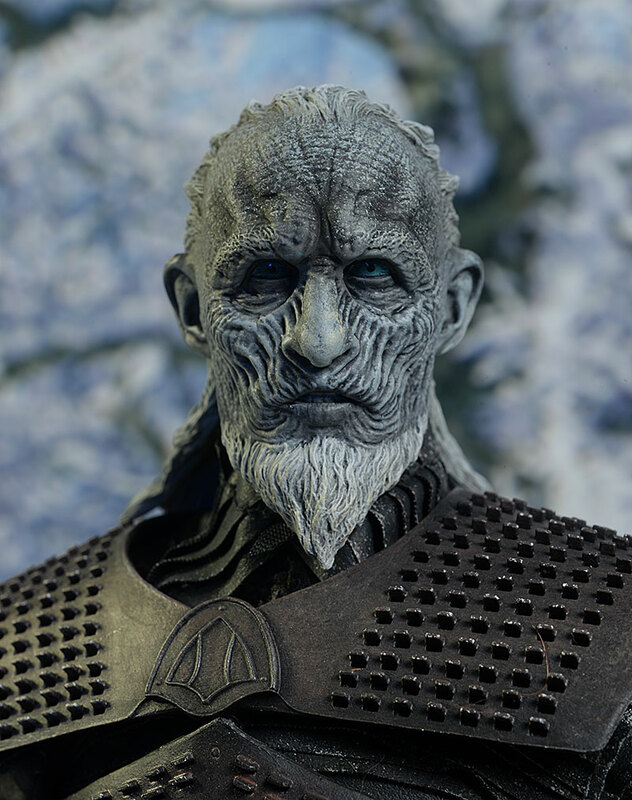 If they announce a Night King - and come on, how can they not? - I'll have to pick up a second one of these guys to go with him on the shelf. And while it has nothing to do with this category, I would like to point out that none of my family or friends bought me the Drogon for my birthday. I may have to turn to a life of crime to afford one. 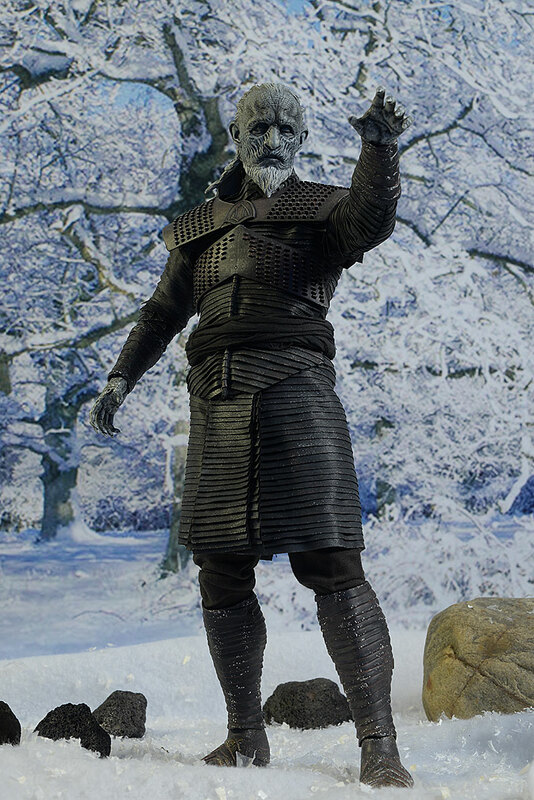 You don't get too many good sixth scale action figures for $200 these days. You get even fewer great ones, and this is a great one. 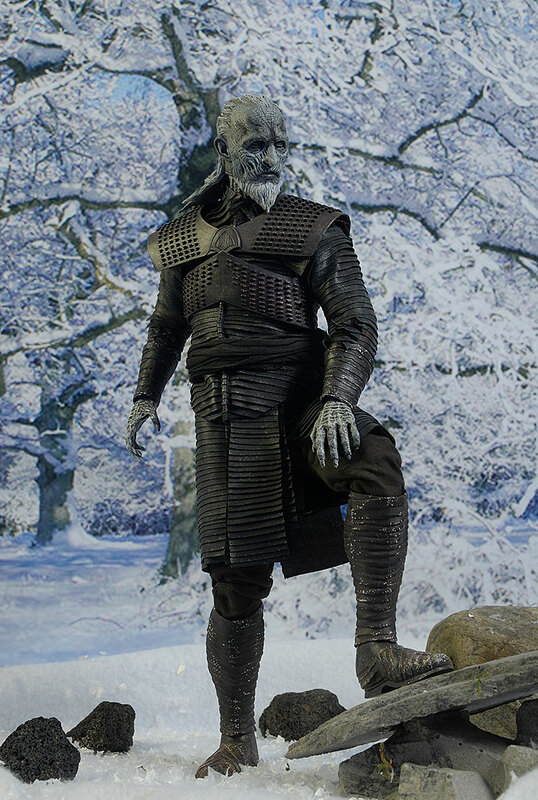 He's already one of my favorites in the series, and coming so close on the heels of the terrific Arya, he has me really geeked to get the upcoming releases. The big one is the little fringes on the spear. They provided an extra set, which goes to tell you they anticipate you screwing them up. The hands are soft enough to wrap around the handle without forcing the fringe through, but you'll still want to take extra care when handling the spear. I really, really like this figure. 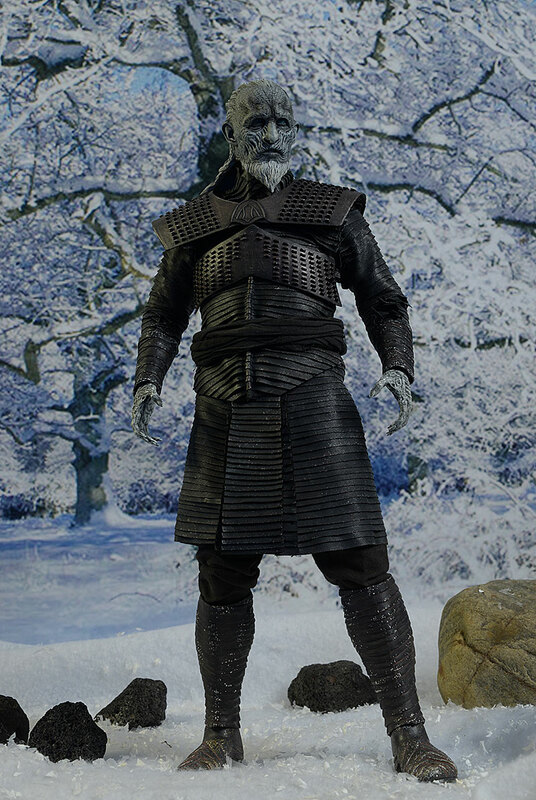 You're getting a terrific sculpt, an even better paint job, a nice outfit and accessories, and a ton of attention to detail all around, for a great price. This isn't something that happens a lot, and ThreeZero is taking the lead with the lower cost sixth scale market. 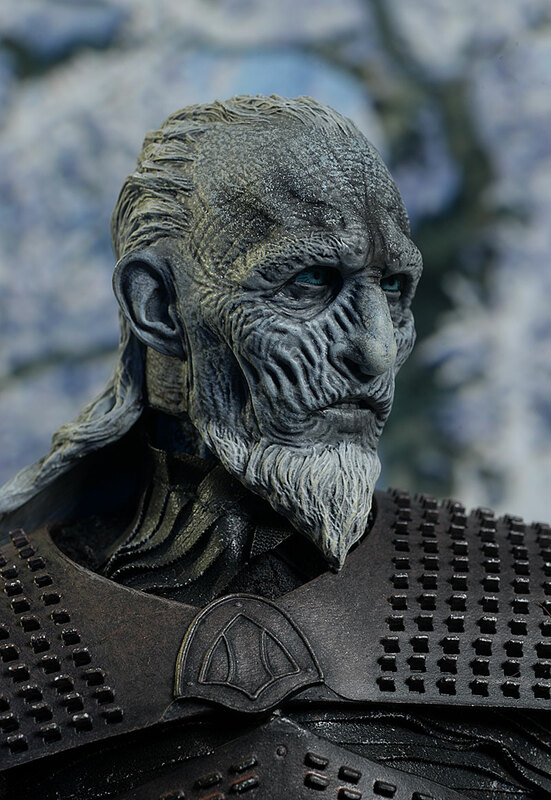 They have to give us a Night King figure, it's a must. And with Brienne, Cersei, and a season 7 Tyrion already on the way (not to mention that uber sweet and oh so expensive Drogon), the line won't be ending any time soon. - has the regular for $185 and the deluxe for $205. - Entertainment Earth has the deluxe for $209, but with free shipping. I just covered their Arya, and before that we had Daenerys, The Hound, Jaime Lannister, Tyrion, Ned, and Jon Snow.